PHOENIX – Two days after the Cleveland Indians announced that the Chief Wahoo logo would be retired in 2019, Arizona politicians said they hope to limit disparaging professional sports team logos from appearing in publicly funded sports venues. 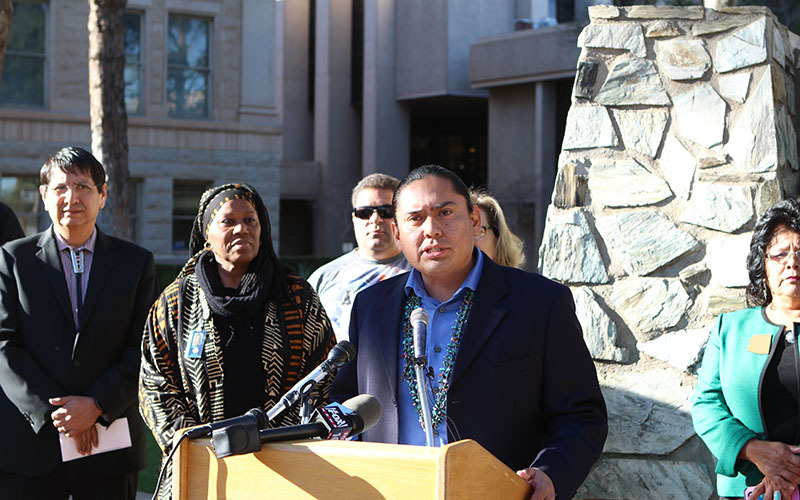 State Rep. Eric Descheenie announced in a press conference Wednesday that House Bill 2499, if passed, would prohibit publicly funded sports facilities in Arizona from displaying the name Redskins in association with Washington’s NFL franchise. Washington is scheduled to play the Arizona Cardinals in University of Phoenix Stadium in 2018. Navajo Nation vice president Jonathan Nez, Amanda Blackhorse, lead plaintiff in Blackhorse vs. Pro Football Inc., and state Rep. Geraldine Peten, D-Goodyear, joined Descheenie at the press conference. The bill faces uncertainty, and Descheenie acknowledged the bill’s passage into law could be a long shot. Amanda Tachine, postdoctoral scholar at the Center for Indian Education at Arizona State University, said Bill 2499 at the very least gives hope for a better future. The bill comes on the heels of the Cleveland Indians announcement that it’s retiring Chief Wahoo next year. That’s a positive step, Tachine said, there’s still work to do. “I applaud Cleveland in taking efforts to not include that caricature, that image, but they still have Indians as part of the name that they will still profit from,” Techine said. Techine isn’t the only one who believes that the Native American community still has a far way to go to get the relationship between Native Americans and non-Native Americans to a place of unity. “I believe the state of Arizona has a bright future once it begins to gain a conscience,” Descheenie said. Hurdles remain. A question raised during the press conference was the notion that if one of the 22 tribes in Arizona finds offense to a name, will that name be banned from being used at a publicly funded sports venue?